As presenters we demand a lot of our audiences. The fairest exchange involves trading time and attention (from the audience) for preparation and relevance (from the presenter). Audiences often fail on their end of the deal, but it's more productive and pro-active to focus on what presenters can do to deliver better experiences. It's amazing! Too many people, in too many companies are exiting presentations with headaches, exhaustion and confusion. Asking the right questions will help. Presentations exist because we need audiences to act. Presentations are business communications that benefit from innovations in other fields. Every day, professionals in media, advertising, education and entertainment compete for our attention. One thing is clear, if you want your audience to stay with you, make it worth their while. Why should presentations be different? Film yourself, and watch – How long before you want to pause? Checked your visuals for typos? Reviewed seating, acoustics, temperature, lighting of your presentation space? Remember that whether or not you are in charge of your space, you are responsible for your audience's experience. Respect your audience. Make your presentation worth their time and attention. Invite them to act and join you in moving your project forward. I have witnessed good public speakers fail miserably. They are prepared, confident and they exude positive vocal and visual energy. They have worked several hours on their PowerPoint presentation. There is a critical problem that we see over and over again. They are skilled at using the PowerPoint program, however they don't know what information to include on each slide. How to organize and visualize content is a vital component of a successful presentation. To communicate an idea, a proposal, an improvement, a benefit; we must tell a compelling story that an audience wants to hear. These are challenges that most presenters face and they can make or break a presentation. Thankfully, there are simple solutions you can follow that are extremely helpful. First, use a format to organize your content. Make sure your message is clear. Formats reduce preparation time and often, the duration of a presentation. They are more efficient than just brainstorming information onto a page or a visual. They also help speakers focus their messages better and improve transition from one point to another. After storyboarding, transfer your visuals to PowerPoint or Keynote. If you're obliged to overload a visual, try building or breaking up. This way, you can show small amounts of information at one time which facilitates understanding by your audiences and greater impact by the presenter. We hope you find these tips helpful. Please contact David or Alex for more information. Few things will improve your presentations more than pen and paper. Writing, drawing and editing save time and clarify thinking. Clear ideas are powerful and memorable. In preparing presentations, a lot of time is spent producing Powerpoint visuals. It's amazing how much information our participants are able to access and generate in relatively little time. There are volumes upon volumes of easily accessible, and abundant information. What do I want my audience to do when this presentation ends? Remember, you're working back from a distinct goal. It's your job to edit in information that supports your goal and edit out distractions; maintaining a high degree of honesty and professional ethics in the data you choose to present. With your goal in mind, take time to write down several ways to get there. Try not to fall in love with your first idea. Working with pen and paper will allow you to spend less, more productive time on your computer; while informing, entertaining and inspiring your audiences. This article is the first of a series. The purpose of The Future of Presenting is simple. We will use observation, study and writing to address the exciting new features and nascent problems of new communication technologies. This series looks to integrate well-established principles of communication with the potential advances in new technology. Presentation technology is changing, and will continue to change the way we communicate. Advances in processor speed, touch technology, bandwidth, videoconferencing, gaming, portability and polling; along with security and expense concerns have already started to change the way we share ideas around the world. Think of this as a space for speculation, invention and ultimately, solutions. Powerpoint, and programs like it, are powerful tools for sharing ideas that have democratized the creation and delivery of presentations. Their success can be measured in projects launched and relationships strengthened between presenters and their audiences. Powerpoint itself, has been celebrated by David Byrne and criticized by Edward Tufte. In the quarter century since it's release, this software package has moved well beyond presentations to change the way we communicate. But around the world, there persists to this day, a gulf between the recommendations of presentation scholars and the practices of presenters. I know that in my past decade as a trainer, designer and program developer, every group has lent me new insights into how people use their tools, create their policies and address their needs. As an audience member I have seen many speakers, who after hours of work (and minutes of sleep) have delivered presentations that undermine their message and tire their audiences. Lamps are brighter and images are sharper than ever. It has been a decade since they started exceeding the resolution of a 35mm slide, the previous standard. This allows for lighter backgrounds and smaller type to appear more attractive on screen. Issue 2: When it comes to type size, if your goal is to share a message with your audience, why make them squint for it? The way audiences relate to information on screen is closer to a billboard than a newspaper. Smaller type often means more type – Presenters become readers, and audiences (since silent reading is faster than reading aloud) become faster readers. Of course, there are many benefits to superior projectors: More design options, beautiful display of high-res images and the ability to keep the lights on (and your audience awake). They are also lighter, smaller and more silent. Apple Keynote (my preferred tool) is also versatile, but not nearly as ubiquitous. Presentation programs are deep, very deep. They are horizontal boxes that hold all sorts of media and allow for many options. Issue 1: This versatility means that if you stare at a blank canvas without a strategy, it will take a long time to find your way. You can invest hours of work without ever addressing the why? behind your decisions. And will very likely overload it. In filmmaking, there's a work phase called pre-production; it includes tasks like writing, storyboarding and scheduling. Successful pre-production generally means a stronger story, fewer budget concerns and less editing time. Invest time in pre-production. Make an outline, share it with someone else – Do they understand it? Could your arguments be more convincing? Write, draw, think and erase… Before opening the program. Issue 2: Powerpoint is everywhere. 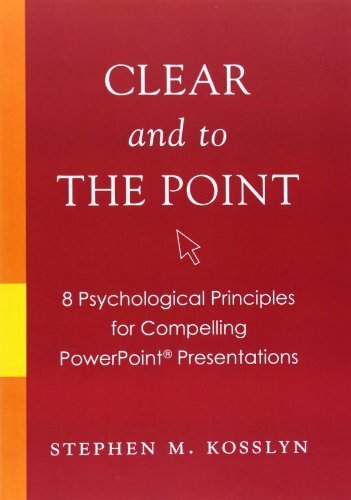 Presenters in all industries have heard the phrase "send me the powerpoint" before they have gotten up to present. If your audience has read your presentation or if they're moving through your slides while you're speaking; they will pay less attention to you. Use your power responsibly. Remember, the goal is for you (the presenter) to deliver your message to your audience. Over the past decade, many authors, mostly from the West Coast of the United States, have done truly amazing work in advancing the design of presentations. Authors like Nancy Duarte, Cliff Atkinson, Garr Reynolds and Carmine Gallo are gifted writers and thinkers. As an illustrator and trainer, I have been awed by their eloquence in codifying design solutions that I had only begun to intuit, and experiment with on my own. Issue 1: There's one issue where we part ways; their cleverly worded conclusion that bullets kill. I am all for reducing the number of bullet slides in presentations. Their sheer repetitiveness makes them difficult to remember, but their usefulness is often overlooked. The studies they cite from the UCSB are sound, showing that when an audience sees a presenter reading text on a screen, their understanding is compromised. Many of Edward Tufte's points in The Cognitive Style of Powerpoint are also correct and important. But both seem to be based based on a misunderstanding of proven skills to present bulleted text and of the time constraints of modern corporations. In other words, while their principles are gospel among trainers and experts, few presenters apply them. Issue 2: Shorter presentations have been proven to be more effective than long ones. The problem is that taking this fact, on it's own, leads to unintended consequences. For instance, there's a time fallacy attached to a number of visuals. I have seen presenters deliver one slide for 20 minutes and have seen others deliver 20 in the same period. Given a numerical limit of slides, on it's own, most presenters will cram as much information as they can into the slides they have. Seriously. The other scenario involves a time limit. Presenters will often zip through visuals without addressing elements on screen; reducing their overall effectiveness. In presenting information they do not address, they're setting themselves up for unexpected questions too. Better design principles and shorter presentations are both admirable and attainable. They're also subject to constant study and revision as technology throws new communication challenges our way. I know that in my past decade as a trainer, designer and program developer, every group has lent me new insights into how people use their tools, create their policies and address their needs. Successful as it is, being the de facto presentation platform, it's a sad legacy of our Powerpoint era that for many people, presentations are more about filling a screen than inspiring an audience. Presentation technology exists to serve presenters and their relationship with their audience.